Today I had some time to stamp... and, as I felt some stamp withdrawal, I really longed to stamp. I checked out today's Splitcoast Limited Supplies challenge - and at first, I was a little bit disappointed that we were to use only ONE stamp... you see, I'm in kind of a stamp withdrawal, LOL! We were to use a sentiment stamp, a single sentiment stamp, no more stamps... But then I thought of this wonderful sentiment - it is oh so true... and I really enjoyed this challenge! 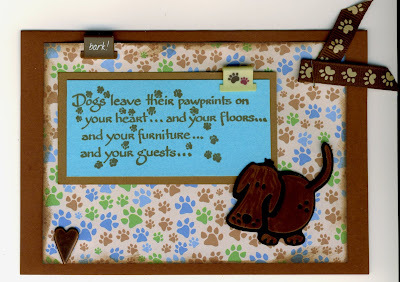 The stamp is by Eureka Stamps, the design paper by DCWV (Scrapbook Kit in a Stack - Dogs), the heart brad by Reprint of Scandinavia, the clips by Around the Block, and the dog is die-cut with the CuttleKids Hamilton die.